Despite the creation of many legal instruments over the last sixty years, energy policy in the EU remains mainly defined at the national level. Energy policy is linked with the vital security of the state. Therefore, the integration of energy policies in the EU is closely related to the issue of delegating national sovereignty to supranational institutions. The reluctance of governments to commit such a transfer of sovereignty is better understood in the light of the concept of energy security. Specifically, understanding how national decision makers conceptualize energy security brings light on the “diverging national interests” that jeopardize the fulfilment of the European Energy Union. Energy policy is at the heart of the project of European integration. Already in 1951, the European Coal and Steel Community (ECSC) aimed at pooling coal and steel resources, because war should be made “materially impossible” as stated in French Foreign Minister Robert Schuman’s declaration of 9 May 1950. Energy resources would later be again a cornerstone of European integration along with trade. Indeed, the European Economic Community created in 1957 had a twin sister: the European Atomic Energy Community (Euratom), an economic union aiming a specialist market for civil nuclear energy in Europe. The concept of energy security has its basis at the level of nation-states. It is a historical construct. It varies highly within the EU, and one can question if there is a single concept of energy security prevailing at the EU level at all. This question matters with regards to both internal and external energy relations of the EU. Energy security in political science is, as any other analytical tool, subject to numerous definitions. Barry Barton proposes a comprehensive definition that encompasses all aspects of security studies. According to him, energy security is reached when a state and the totality or majority of its citizens and enterprises have a guaranteed access to sufficient energy resources, when the resources are at an affordable price and when there is no threat of disruption of supply of energy resources in the near future. Energy security must be then understood not only as the mitigation of military threats on energy facilities, but also as the prevention of threats of economic, political, societal and environmental dimensions. The concept of energy security is interdependent with the security of energy supply. At the European level, the security of energy supply is at the centre of the energy policy since the European Commission published the so-called Green Paper on energy in 2000 and 2006. These documents were respectively meant to stimulate discussions at the European level on “the security of energy supply” and on a “European Strategy for Sustainable, Competitive and Secure Energy”. With the entry into force of the Lisbon Treaty in 2009, energy policy was finally supported by provisions in the primary law of the EU. Still, those provisions are entailed in a single article (Art. 194 TFEU), and the majority of legal provisions regulating energy policies in the EU are to be found in the secondary legislation (eg. Regulations and Directives). Security of energy supply is defined by the European institutions according to four criteria: physical security (physical availability on sight of both the resources and the required infrastructure of transport), price security (affordability and prevention of uncontrolled price fluctuation), geographical security (availability of resources in the neighbourhood and the required infrastructure to channel them on long distance) and finally, political security of supply. To better highlight the complexity of this concept, Robert Skinner distinguishes between Hard Energy Security (which encompasses the economic aspect of supplying energy resources) and the Soft Energy Security, the psychological conceptualisation of energy security by the decision makers. Hence, securing the supplies of energy resources means not only to build the infrastructures needed to transport the said resources and to sign economically viable contract with suppliers. Security of supply implies to trust the political and economic partners involved in the supply chain. Yet, the EU’s concept of energy security is the synthesis of the Member States’ representations of their security of energy supply. Those representations are sometimes conflictual. If they seem to be antagonistic, as it is the case with the project of pipeline Nord Stream 2, it is because they are set on different conceptions of energy security. To illustrate this point, let us have a look at the gas profiles of Poland and Germany and see how they influence their concepts of energy security. Since the post-communist transition, the Polish international energy strategy can be understood as the search for secured gas imports. It started in 1992 with Gazprom’s proposal to build a pipeline connecting natural gas fields in Western Siberia and the Yamal peninsula to the European markets (the so-called Yamal–Europe pipeline). Agreeing on the project, Poland became a transit country. This geopolitical position guarantees economical incomes and, expectantly, an increased bargaining power with the gas supplier. However, the geopolitical risks of having a single gas supplier were already pointed at by some official back then. Over the 1990s, Poland paid too much for the gas it was importing, and was importing much more than what its internal consumption required, both because of the “take or pay”-clause entailed in the gas contract signed with Gazprom. For this reason, the Polish energy policy evolved toward the diversification of gas suppliers while its diplomacy fought for years to renegotiate the contract with Gazprom in 1993. In 2003, they managed to reduce the quantity of imported gas to the real needs of the Polish market. The “take or pay”-clause disappeared only in 2010, consequently to the adoption of the “Third Gas Directive” at the European level in 2009. Gas matters a lot in the Polish “energy mix” (the share of each primary energy sources such as gas and coal in the overall energy consumption of a given territory). Its share rose from 9% to 14% between 1990 and 2013. One third of the domestic consumption is covered by domestic production. In 2012, Poland remained dependent on Russia for 56% of its gas imports. Because of the growing dependence on Russian gas, polish energy policy developed a strong interest for alternative supply routes, looking notably toward Norway and Denmark. Numerous projects of infrastructures were conceptualized since 1990s over the past decades, such as: the onshore pipeline “Amber” (dropped off) or the offshore pipeline “Baltic Pipe” (in discussion since the 1990s, anew since 2016). The Baltic Pipe should link Poland to Norway via the Denmark. Norway is attractive as a gas supplier for Poland because as a member of the European Free Trade Area (unlike Russia) it is bounded to the rules of the European Single Market. In January 2017, the Polish Foreign Minister Witold Waszczykowski stressed the priorities of the energy policy in his yearly address on the Polish foreign policy, underlying that an access to the Norwegian gas storage facilities is a “strategic issue” for security of energy supply not only of his country, but of the whole EU. A German representation of security of energy supply at odds with the Polish one? In the Polish energy landscape, Germany appears as a political partner with competing energetic interests. Such a competition results from the very difference between the Polish and the German representations of their respective security of energy supply. The Poles strive for reducing the risks of a disruption in energy supplies. Hence, they have a “geopolitical” concept of security of energy supply. The German concept is said to be “economical” (also called “technical”), because they want to secure available and affordable energy for their high consuming industry. Since the choice taken in 2011 to phase out nuclear power plants (Energiewende), the gas share in the German energy mix has increased significantly, because gas became the alternative energy source to produce the electricity needed by the industry. Russia is also the main gas supplier of German, but it represented only one third of its imports in 2012. The need to ensure cheap gas on the long term for the German industry explains the government’s positive attitude toward the pipeline project Nord Stream 2 which should double the direct flow of gas between Germany and Russia (up to 110 bcm/year). While this pipeline would increase the European security of energy supply in the German view (in economic terms), it would decrease it according to the Polish conception, because it means more dependence toward a single supplier of energy resources (in geopolitical terms). Those diverging representations of the security of energy supply are not to be linked with a Polish or a German “mind-set”. There is no essentialism behind those conceptualizations. They are really the result of the historical evolutions of the country’s respective energy market, along with ideas, norms, and values socially aggregated through specific institutional venues. Hence, the Polish “geopolitical” concept is linked to the fact that the Polish market remains much less developed and interconnected than the German one. The Polish concept is based on risk assessment because they are already highly dependent on Russian gas and they have suffered twice from the disruption of gas supply in 2006 and 2008/9. How to reconcile diverging perceptions of energy security between member states? The consequence of diverging conception of energy security leads to the definition of antagonist energy policies at the member state level. Nord Stream 2 is a bone of contention of the German-Polish energy relationship because it crystallises not only those antagonistic concepts, but it is also the expression of diverging economic and political interests. Another example of the consequences of these diverging concepts are the way chosen by both countries to diversify their energy mix, which is one of the steps to be undertaken to reach the goals of the Commission’s “European Energy Security Strategy” of May 2014. Germany goes back to coal and gas in order to phase out nuclear energy, whereas its energy mix was already diversified. In contrary, the Polish energy mix still needs to be diversified drastically because coal remains predominant and the Polish government sees the key of its diversification in the development of nuclear energy. According to Aleksandra Gawlikowska-Fyk, Head of the Energy project at the Polish Institute of International Affairs, the long term purpose of Polish energy policy under the current government is a full independence from Russian gas and oil import. 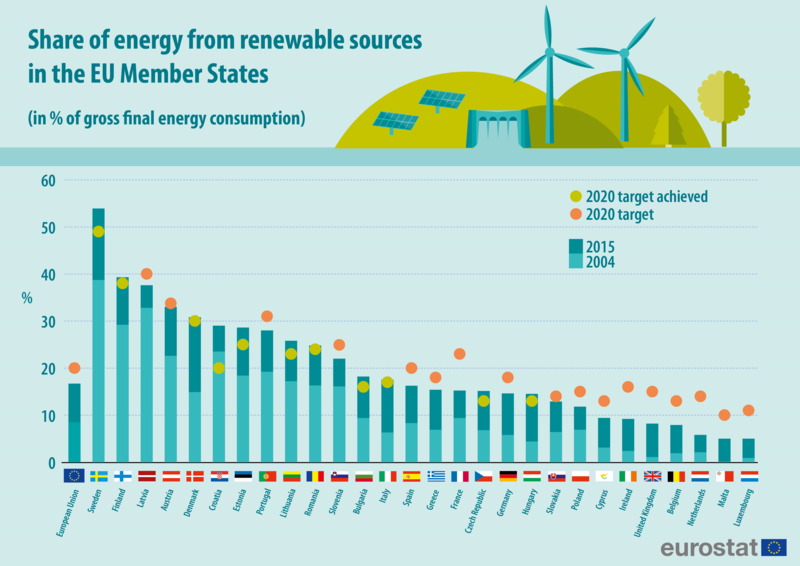 When it comes to the share of energies from renewable resources in their energy mixes, both countries remained below the European threshold in 2015 and hadn’t yet reached their 2020 targets. How to reconcile those antagonist perceptions at the European level? According to Andreas Heinrich, co-author of a major comparative study of Polish and German views on the Energy Union, only dialogue at bilateral and European level can help to overcome this disparity of perception. The need to understand each other is again at the heart of deadlocks of the European integration process. This answer might seem trivial for the reader, but it is of highest importance if we want to develop a common European external energy policy. The Commission must also be aware of and understand each Member States representation of energy security to ensure their supports in drafting the future European energy legislation. As long as we live in a European Union and not in a European Federation, understanding each other's national sensibility in the light of the national historical developments will remain the key to solve the everlasting dilemma of EU integration: How to match diverging national interests of the Member States with the common interests of the Union and its 550 million citizens? Samuel Bailey “Map of the Yamal-Europe natural gas transportation pipeline” 15 November 2009. Polish and German Energy mixes: Łada Agnieszka (et. all.) (edit. ), The Energy Union: Views from France, Germany, Poland, and the United Kingdom. Institut of Public Affairs, Varsovie, 2015. pp. 55 & 93. BARTON Barry (et.al.) (edit. ), Energy Security: Managing Risk in a Dynamic Legal and Regulatory Environment. Oxford University Press, 2004. BELLIGOLI Serena, North Stream à l'épreuve des relations euro-russes, Université catholique de Louvain, IEE-Document n°47, janvier 2012. BÖHME Dimo, EU-Russia Energy Relations: What Chance for Solutions? : a Focus on the Natural gaz sector. Universitätsverlag Potsdam, 2011. BROWN Heather, « Post-Communist Poland and the European Union: Energy Policy and Relations with Russia », in The Polish Review, Vol. 61, No. 3, 2016. p. 85-98, doi:10.5406/polishreview.61.3.0085. CORRELJÉ Aad, VAN DER LINDE Coby, « Energy supply security and geopolitics: A European perspective », in: Energy Policy n°34, 2006. p. 532–543, doi: 10.1016/j.enpol.2005.11.008. ESCRIBANO Gonzalo, GARCIA-VERDUGO Javier, « Energy security, energy corridors and the geopolitical concept », in: Escribano, Garcia-Verdugo, Marin-Quemada (dir. ), Energy security for the EU in the 21st century. Market, geopolitics and corridors. Routledge, New York, 2010. HEINRICH Andreas (et. al. ), « Auf dem Weg zu einer gemeinsamen europäischen Energiepolitik ? Energiesicherheitsdebatte in Polen und Deutschland », Polen Analysen, n° 190, 01.11.2016. p. 2-8. HEINRICH Andreas, « Poland as a Transit Country for Russian Natural Gas: Potential for Conflict », Koszalin Institut of comparative European studies, Koszalin, 2007. KAMOLA-CIEŚLIK Małgorzata , « LNG terminal in Świnoujście as an element of Poland’s energy security », in Polish Political Science Yearbook, Vol. 44, 2015. p. 268-282. ŁADA Agnieszka (et. all.) (edit. ), The Energy Union: Views from France, Germany, Poland, and the United Kingdom. Institut of Public Affairs, Varsovie, 2015. TALSETH Lars-Christian U, The politics of Power, EU-Russia Energy Relations in the 21st century. Palgrave-Macmillan, Cham, Switzerland. 2017. HARPER Jo, « Poland and Norway revisit gas terminal and pipeline plans », Central European Financial Observer, 25.03.2016. Ministère des Affaires étrangères de la République de Pologne, « Minister Witold Waszczykowski on Polish diplomacy priorities in 2017 ». 9 February 2017. RAABE Stephan, « The dispute over the Baltic gas pipeline. A threat or a necessary supply project? », Konrad-Adenauer-Stiftung, Auslandsinformationen 2/2009., Berlin, 6 avril 2009. SKINNER, Robert, « Strategies for a greater Energy security and Resources Security », Oxford Institute for Energy Studies, Juin 2006. 12 pp. Vytautas Sirijos Gira, « The Polish-Russian Deal on Natural Gas Supply: The Incapacity of the EU Energy Policy », in Eastern European Studies Center: Eastern Pulse, Analytical Newsletter 2010 No. 6 (34). 8 pp. Francis Masson is an Academic Assistant at the College of Europe Natolin. He graduated from the College of Europe interdisciplinary Studies program in 2017. He is also a graduate of the Institute d’étude Européenne of the Université Paris 2 – Sorbonne Nouvelle (2016). Prior to the College of Europe, he worked for the Brandenbourg based Fondation Genshagen for Franco-German-Polish cooperation. His areas of interests are the Franco-German relationship, the Weimar Triangle and the energy policy of the European Union and its member states.